diameter at rim 10.3 cm. diameter of body 13.3 cm. The lydion has the shape ty;ical of this ldnd of vessel, with spherical body and narrow conical foot. At the top of the wide straight neck is a short horizontal rim. The vessel is painted with narrow brown bands on the body and solid dark red-brown on the neck and foot. 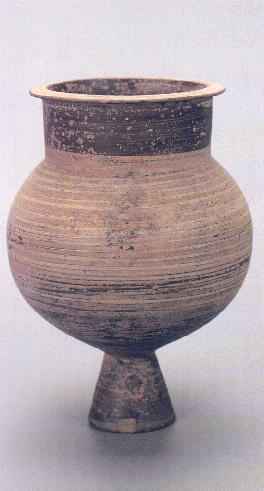 The lydion derived its name from the Lydians, the makers of this form of vessel. The shape may have been of Egyptian derivation. 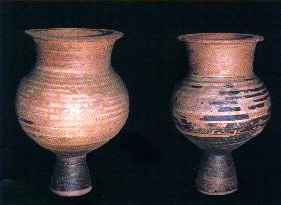 Of a total of sixteen baked clay vessels of this type from Ikiztepe, one is in the Ankara Museum of Anatolian Civilizations (no.88), the other fifteen, two of which are illustrated below, are in the Usak Museum (Usak 1.29.70 - 1.43.70). Their use as ointment containers complements the presence of several alabastra in the same tomb. The silver lyd ion is important as the only known example of this type of vessel made from precious metal.